There is plenty of electrical work to be done when converting the loft and a major part of the first stage work is installing the sockets and cables. By this stage all the structural work and much of the internal work will have been finished and the electrical work needs to be sorted before the final finishing off and decorating can begin. With the plethora of electrical items we all need these days, TV's, DVDs, stereos, game consoles, computers etc, it is vital that there are plenty of power points installed in the new loft room. Make sure each socket is a double and that they are distributed right around the room. 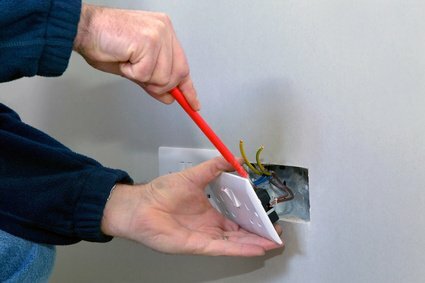 As a guide a normal sized room would probably need at least for double sockets but there is no reason why more shouldn't be installed. The cost of each additional power point is tiny when looked at in terms of the overall budget so make sure you include plenty of outlets in your plans. The cabling for the loft conversion electrics needs to be sorted before the final finishing is done but don't be concerned that if at this stage there are cables and wires poking out of walls and sockets. This will all be tidied up when the second fix is done. At this first fix stage it is necessary for the electrician to run the cables. If you are doing this part of the work yourself there are a few things to bear in mind. If cabling needs to be run through any of the new joists great care must be taken not to weaken them. Do not cut into them but carefully drill a hole through the centre of the joist about halfway up. Make sure the holes are kept as small as possible and, should the need arise to drill more than once into a joist, ensure that the holes are well spaced apart. On no account drill anywhere near either end of the joist. If the cabling is going through the new stud walls than things are very much easier. The cables can be run through the timber frame before the plasterboard is mounted. Cabling in party walls should be run vertically from the sockets. This is pretty much standard practice so that they can be easily located in the future should they need to be accessed for any reason.